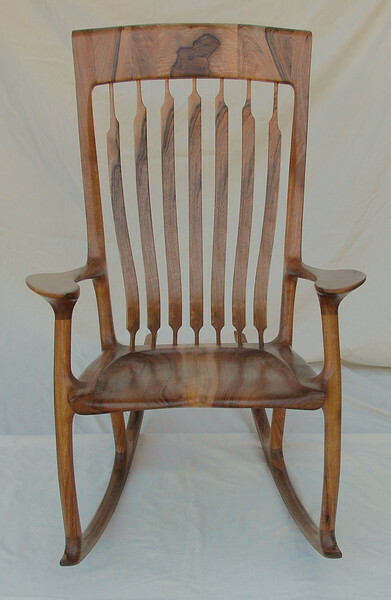 Curt's English Walnut Masterpiece, made under the mentorship of Hal Taylor at Rocking Chair University. Here's an oblique front view of my chair. Photos do not do justice to the chair. 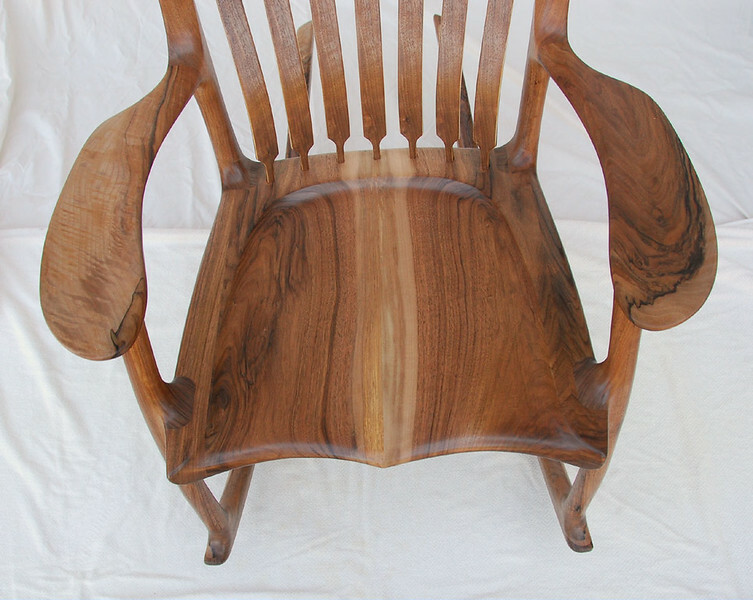 Each chair is custom fitted to the person buying it, and you really must sit in it to know what a perfect rocking chair feels like. 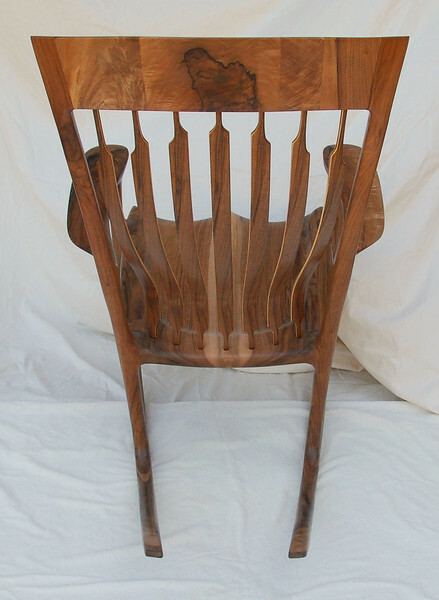 I had done a lot of woodwork before making this chair. However, I had always avoided chairs because nothing comes together at a right angle. 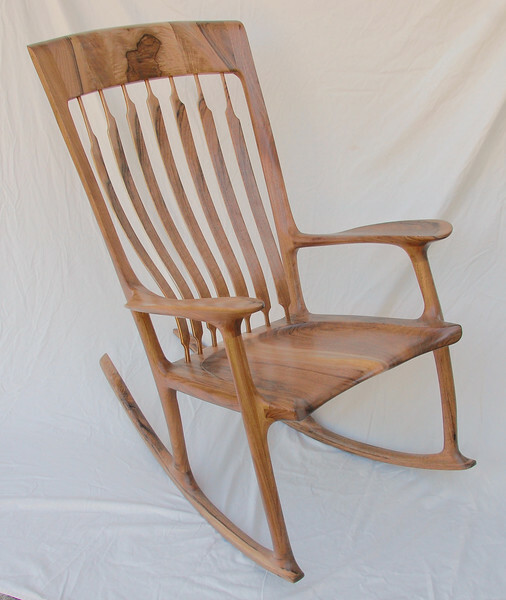 I now know that making a rocking chair is about two orders of magnitude more difficult than making a china cabinet or dining room table. 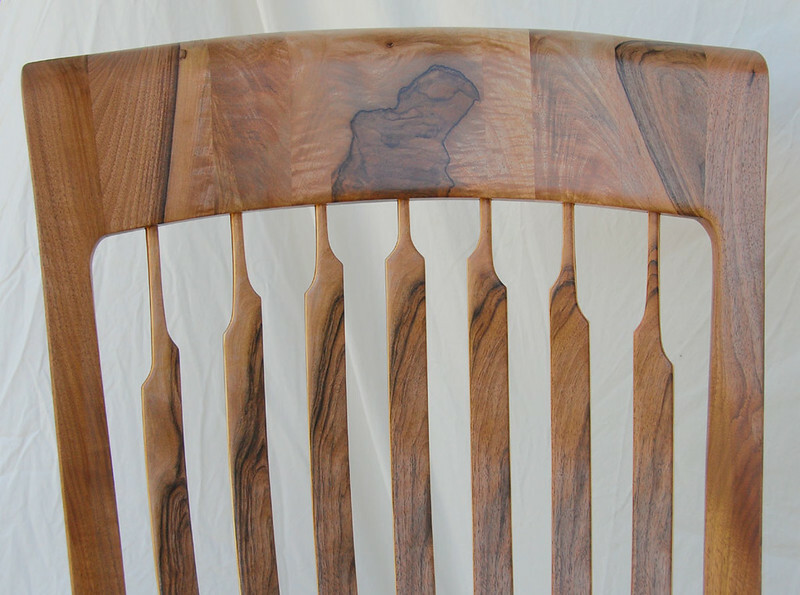 Rocking chairs are as much art as woodworking skill. 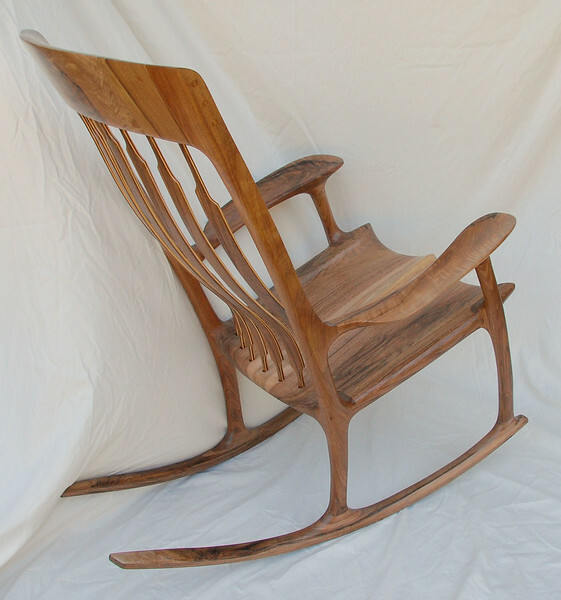 There is an active sub-cult of woodworkers (many of them trained by Hal) who make only wooden rocking chairs. Perhaps the attraction is the combination of sculpture and technical expertise. The seat and arms are scuplted to a perfect fit. 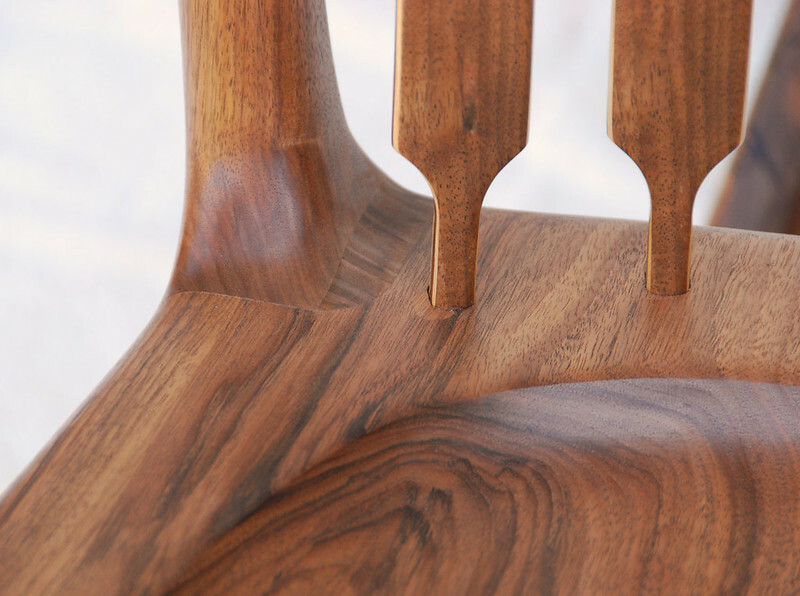 The back braces are not glued in; they float in holes in the seat and head rest so that they can flex a bit as you sit in the chair. This makes the chair very comfortable. Here's the head rest and the top of the back braces. The photo doesn't do justice to the spectacular grain. Hal is a perfectionist on everything, but especially on joints. If a joint was off 1/100 of an inch, it had to be redone or repaired. The effort paid off: you absolutely cannot feel a glue line, and the only way you can see a joint is by a change in grain or color. 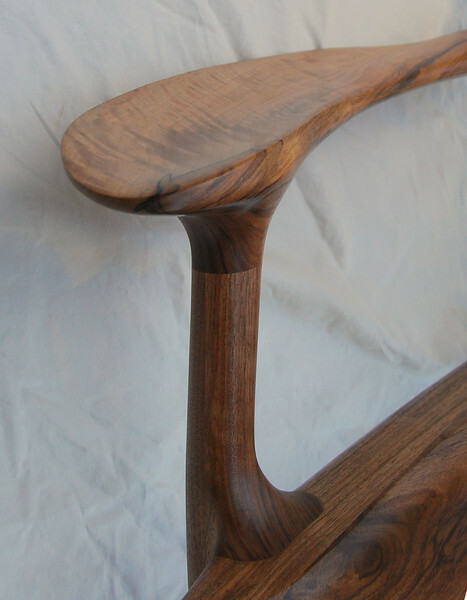 Here the right front leg and seat joint. 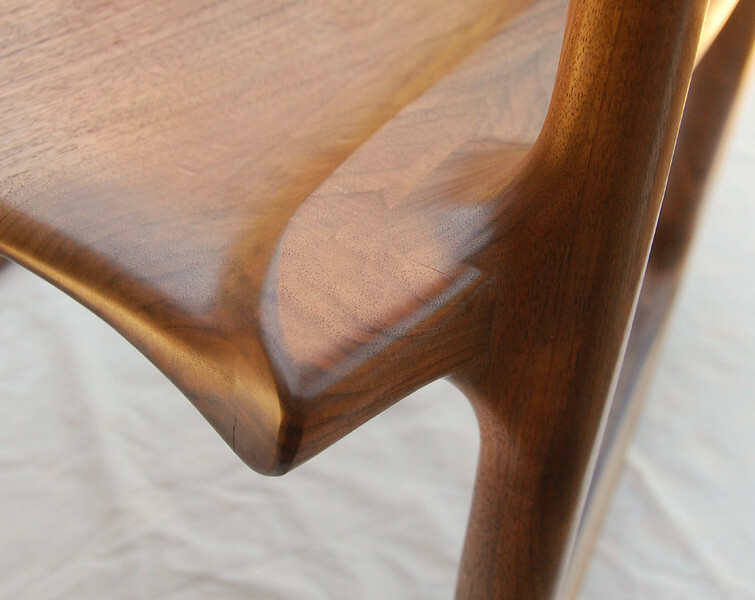 Another absolutely perfect joint, and perfect shaping of the seat and leg. 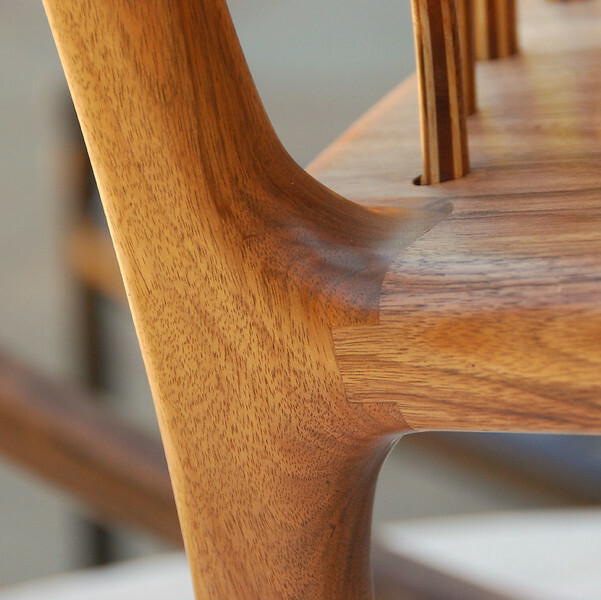 Another view of the joinery and artistic shaping of the chair. 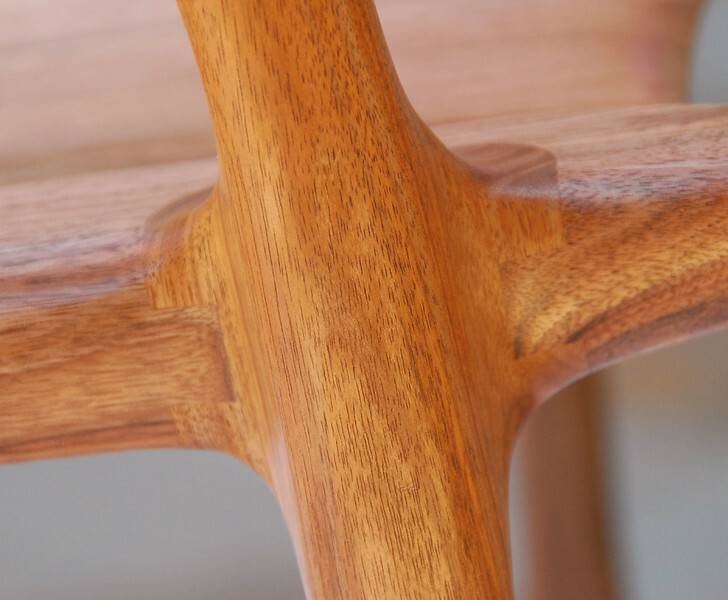 This shows the mortise and tenon joinery of the legs and seat. 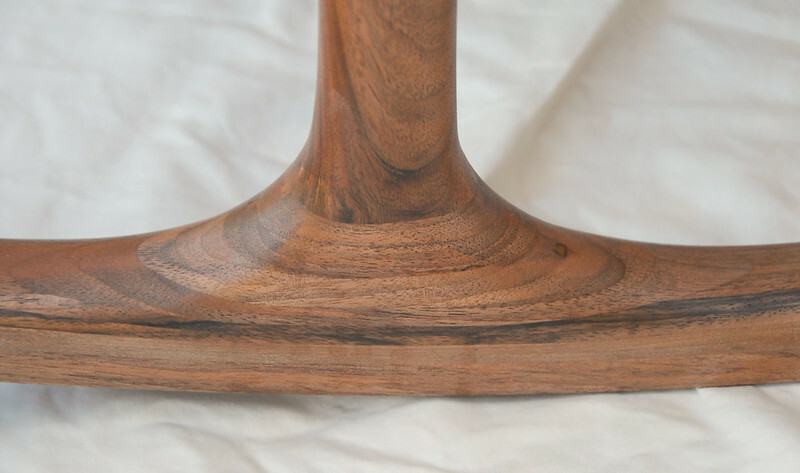 Another view of the leg-seat joinery. This shows the graceful curvature of the right front leg and arm. 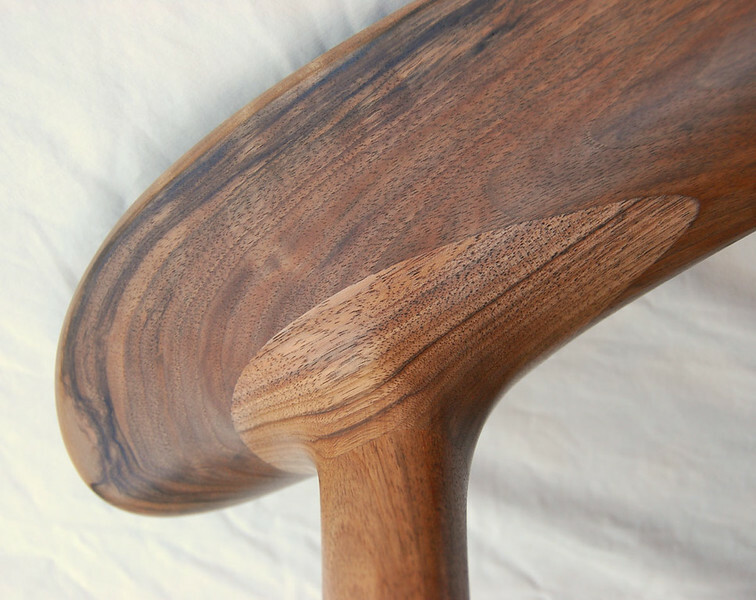 Another view of the right arm showing how it is shaped to give a perfect fit when you are sitting in the chair. Here's the underside of the left arm showing the arm-leg joint. 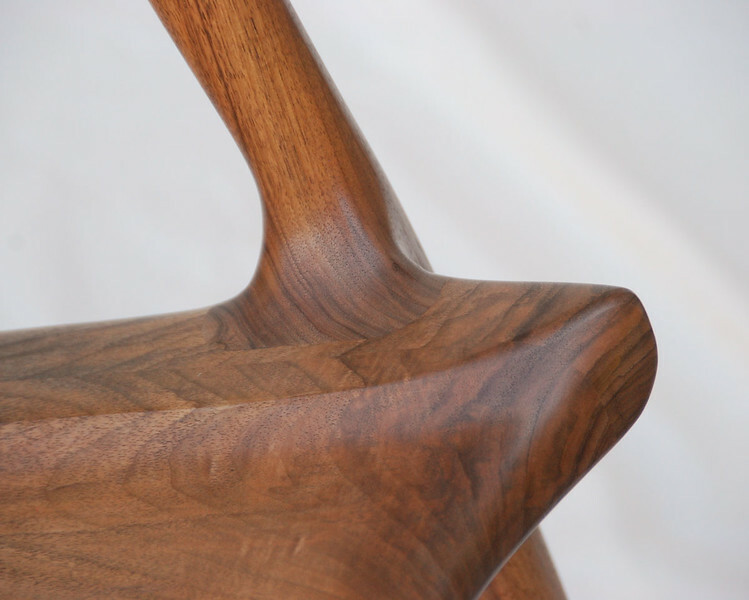 Here's the sculpted joint where a back leg joins a rocker. 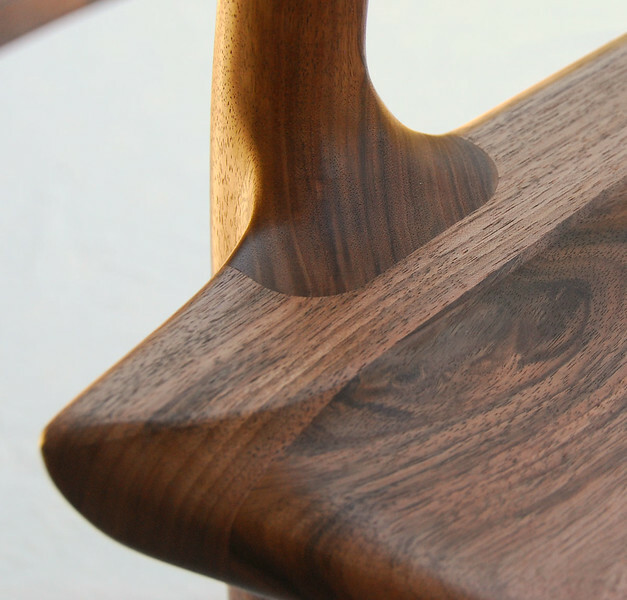 Although you can do a certain amount of rough shaping on a band saw following a template, the final shaping is all done by hand, using only eye and feel. You can simply feel when a curve has achieved perfection. I'm now well equipped for my sunset years. 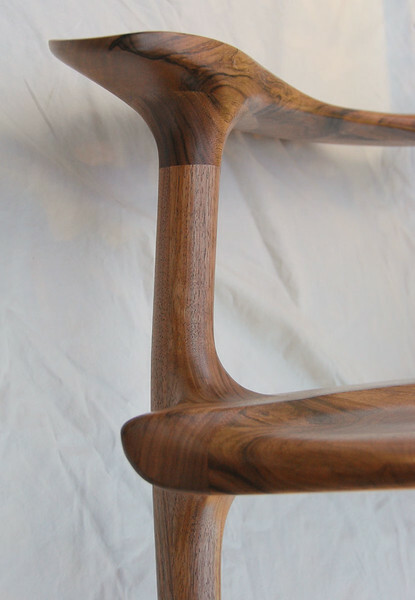 More importantly, I now appreciate what an incredible level of skill Hal Taylor has developed over his 30 years of chair making. I'm sure H.R.H. Prince Charles and The Sultan of Dubai agree with me that Hal's chairs are as close to perfection as people can create.